Two separate deliveries of this programme are offered; full-time on-campus by day and part-time online by night. This page gives details of the part-time online programme. Ireland's first MSc in Artificial Intelligence with an excellent curriculum. This programme is pure AI, no irrelevant modules, take a look for yourself and see excellent modules in Machine Learning, Deep Learning, Natural Language Processing, etc. Also delivered full-time by day over one academic year. In the twenty-first century, AI techniques have experienced a resurgence following concurrent advances in computer power, large amounts of data, and theoretical understanding. AI techniques have become an essential part of the technology industry, helping to solve many challenging problems in computer science. Click this link or the image above to download the programme flyer which contains links to the complete list of modules. This master's degree programme provides a technical deep-dive into the area of Artificial Intelligence (AI). The programme will produce AI graduates with a highly relevant skillset in AI topics. You’ll learn how to use and develop intelligent computer systems that can learn from experience, recognise patterns in vast amounts of data and reason strategically in complex decision making situations. The programme places significant emphasis on student learning by doing. It adopts a practical, hands-on, approach to learning, where all modules are fully assessed using continuous assessment methods. As this is an expert level programme, it is essential for applicants to have a strong proficiency in mathematics, including statistics, and an advanced level of coding competency in Python and C++. To help you prepare for this programme we offer a number of tutorials which we expect you to complete in full before starting this programme in September. Using AI to power the driving experience. The video outlines how data and analytics are driving the new Intel and Ferrari partnership, and how they are using AI to power the driving experience. From in-car analytics to video monitoring to drones, better synthesized data is giving drivers an edge as the industry evolves. The programme contains challenging and interesting modules delivered by lecturers who are experts in AI. Students will also be presented with opportunities to work on modern research case studies linked to the domain expertise of staff in the department. The programme places signifcant emphasis on student learning by doing. It adopts a practical, hands-on, approach to learning, where all modules are fully assessed using continuous assessment methods. There are no formal end of semester written examinations and this ensures that students will learn by doing from the first module to the last. This 60 credit programme is delivered over two 30 credit semesters. Each semester has a number of mandatory modules and a choice of electives (all electives may not be offered). Please click here or the programme schedule button for full module details. 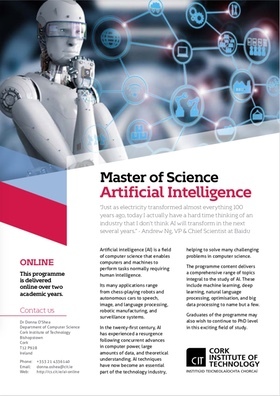 Entry to the MSc in Artificial Intelligence will require a minimum of a Level 8 honours degree in Computer Science, Engineering, Computing or an honours degree in a cognate discipline. As this is an expert level programme, it is essential for applicants to have a strong proficiency in mathematics, including statistics, and an advanced level of coding competency in Python. Applicants who do not meet the above criteria will be considered on a case by case basis. Please see the Recognition of Prior Learning (RPL) page for further details. The following article was recently published in the Irish Independent, Ireland's highest selling daily newspaper. 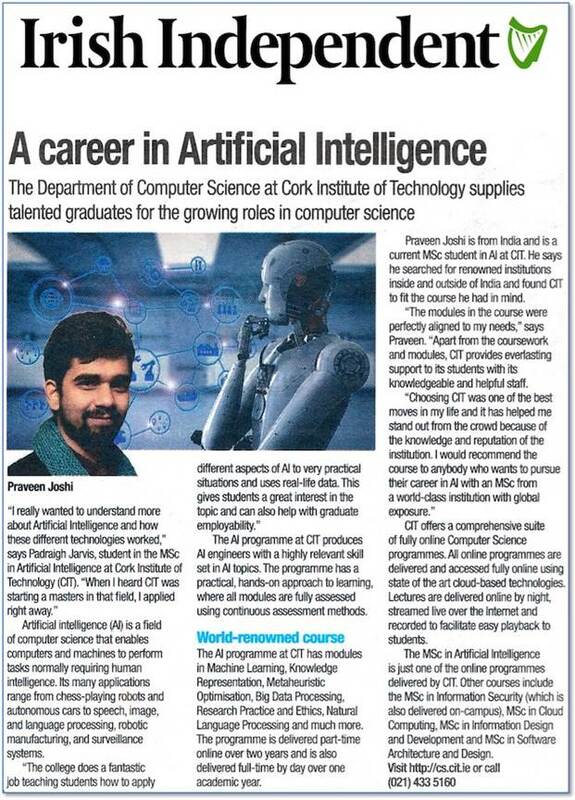 The article features Praveen Joshi and Padraigh Jarvis who are current students of the full-time programme in CIT. This master's degree is a technical programme that assumes you have a competency in programming and a strong grasp of a range of mathematical concepts across areas such as statistics, probability and linear algebra. It is critically important that you have this necessary skillset to help you succeed in your study. In order to focus your preparation for this programme we have made available this resources page. This page contains links to online resources that will allow you to bring your knowledge up the necessary standard. Python is the primary programming language for the programme. We will assume that all incoming students are able to program proficiently and solve problems using Python, NumPy and Pandas. You will notice that the first two sections in the resources page are focused on these topics. These are most important prerequisite topics and you should have a strong competency in these areas before you commence study. We will also assume that you have an understanding of basic data analysis techniques and linear algebra. The third section of the resources page contains links relevant to these topics. Finally one of the modules, Decision Analytics, requires the use of C++. The final section in the resources page provides a number of relevant resources that will help you to come up to speed in this topic. The normal closing date for online programmes is September. However, it's likely that this programme will fill very quickly and the closing date will be earlier. Please click the "Apply Now" button to make an online application for this programme. Please note that you are applying for the online version of this programme. Applicants for the full-time programme should use the link on the full-time page (link at top of this page). The CIT online application system will open in a new window and this will allow you to enter details of your application for this programme. Fields marked with a red asterisk are required fields and need to be completed. You can use the supporting documentation section to add scanned copies of transcripts, your CV, or any other relevant documentation. Please study the entry requirements for this programme and ensure that you've supplied all information that's relevant to your application.